Sometimes there are punctures in my life, this also applies to inflatable boats from PVC. After all, sticking driftwood, glass and the reinforcement rods are not uncommon in the ponds. 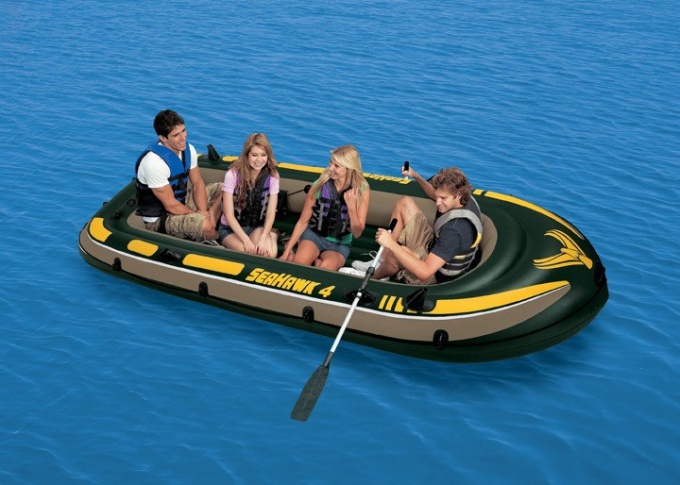 This material is fairly easy to repair and maintenance, therefore at present it is made most inflatable boats. The repair of boats is best done in the garage so the glue could dry completely, although it can be done in the field and on the water. First of all, it is necessary from the strip of material to cut a patch of the desired size and color, they are included in repair kit boats. The patch can be any shape, but preferably, that it was oval or round. In the field it is only necessary to cut corners with rectangular or square workpiece. The maximum length or diameter of the patch should be 3-5 inches bigger than the rip or a puncture. The boat needs to be inflated if it is inflated, the patch just wouldn't stay due to the constant air pressure. Straighten the damaged area on a flat surface and place the soles of the boat or Board. Now you need to degrease the place of gluing and clean it from dirt with a cloth dampened in solvent. You can use acetone, but in the field suitable alcohol. It is not necessary to clean the material with sandpaper, as do many - that you're only going to hurt the boat. Apply the prepared patch to the location of the cut and outline the future place of gluing a pencil. Next, apply to both surfaces glue with a brush and give it a little dry. After 10-15 minutes again repeat the same procedure and let the glue dry. After 5 minutes, you can proceed to the process of gluing. Slightly touch the glue, it needs to be dried up, but a little stick. To activate the glue, you must heat itself the patch and the damaged area. For this you can use a conventional lighter or a Hairdryer. But we must act very carefully, so as not to ignite the material, and only heat. Carry out this operation quickly so that the glue had time to dry completely during this time. Now gently apply the patch on the bonding surface of the damaged boats. But it should be done so under the patch are not left air bubbles. Carefully press hard with the roller. If you do not have a roller, then you can use any possible means, whether the handle of a meat grinder or a knife handle. Then try not to bend the material in the field of gluing, leave to dry for 2-3 days (minimum day).